Other than potty training, which completely drained us, we still had a busy week. Tuesday the city hosted a Girl's Night Out. 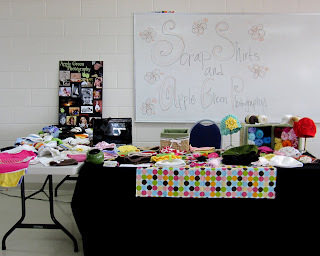 Last year I had a booth set up in a building with Sidney's home-based businesses. This year the city excluded the home-based businesses so I went as just a Mommy. After piano lessons the kids and I walked to the local movie theater and stood in line to get a fun bag filled with promotions, coupons, and little fun prizes. I mostly wanted the coupon(s) for the local quilting shop. I had my eye on a certain length of fabric for a new Amelia outfit. The weather was awesome so the walk was wonderful. Once I got back Justin put his new lawn edger to use. He declared war on all the nasty dandelions growing in our new lawn. My little new seedlings are sprouting both inside and out in the garden box. Justin knew I was struggling with my emotions, he came home from Walmart with real cut flowers! It was a complete surprise! I love them, a spot of bright color sits on my piano. Wednesday afternoon I went to get my hair trimmed. Phillip is a BIT clingy lately, my guess is due to the eye procedure trauma. He was only two feet away from me, crying his little head off. I popped him into my lap where his screams only intensified as the poor hair dresser tried to ignore his crying. I called Alison and Justin but both were busy. I even gave him a lollipop which only decreased his crying to frequent but intermittent screaming. He gave it up after I took a break and walked around with him outside. Once he stopped crying he was happy as a lark, cooing and giggling at the lady. Wierd. Amelia showed Phillip how to sit still while she got her bangs trimmed. 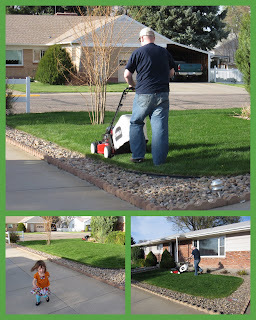 Justin mowed the lawn for the first time in our married life! 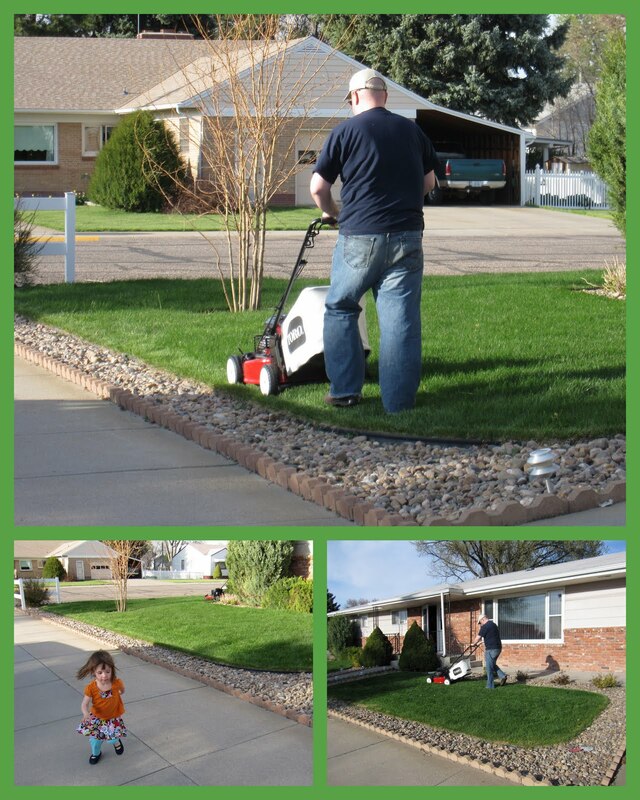 We've never had our own lawn to mow, our first was taken care of by the HOA. Thursday evening Roxanne loaned me her cricut machine. I made a poster to display at the home-based business show on Saturday. Trissa lent me their copy of Avatar. Justin and I had a really fun evening watching the movie, me making the poster, and later being really silly. The movie itself, is really dumb, basically a grandiose dose of environmentalism. Towards the end the main characters were fighting the bad dudes. They communicated using throat microphones by holding two fingers over the mic while talking. It struck us as funny so now we talk to each other using pretend throat mics when we want to be silly. It was a nice comic relief. Friday afternoon Phillip woke up from his nap with the right side of his head soaking in a bloody mess, focusing around his ear area. I thought for sure his ear drum had burst. I took out my otoscope and it appeared the blood came from his ear. I had him to the Dr office an hour before it closed. The Dr said his ear looked fine. We could not find any source for all that blood, no scratches, no nose bleed, no ear wounds, etc. I checked out Amelia too and could not find anything either. The Dr and I were completely flummoxed! Phillip must have killed a huge six inch mosquito or something. What else would produce a couple tablespoons of blood? I had to scurry in order to get everything at home in order to get my booth set up that evening. Saturday I was at the Community Center by 8:45 for the "May Day Extravaganza" event as a vendor. 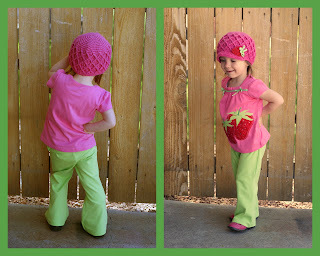 I had examples of all the crochet hat styles folks can order, photography stuff, and a couple shirts from last year's event. Justin brought the kids over around 11:30 so I could nurse Phillip. I used a different approach than last year, since last year was not very successful. This year was even less effective. Only three items sold, two hair clips and one hat. Bummer. I get so many compliments and raves over the hats but no one wants to buy one. Not so sure I will participate again. We packed up the kids once I got back from the event to get Justin to Cheyenne in time for stake priesthood session. The kids and I went to Once Upon a Child consignment store and Hobby Lobby. Phillip now has summer shorts and some pjs that fit. I stocked up on sewing supplies like thread, notions, and scissors at Hobby Lobby. We picked up Justin and then went to Chipotle's for dinner. Oh my, it was delish. The adult session was amazing. I actually got to listen this time! Phillip was pretty good, he only spit up sweet potatoes and turkey all over the back of my chair to the disgust of four single ladies behind us. The first counselor in the Stake Presidency spoke about making lemonade with the lemons of life using the sugar of the atonement and living water. This counsel hit me hard since this week seemed to be more lemons than lemonade. I have an ongoing struggle with trying to by Christlike and defeat my feelings of inadequacy. This week as Amelia potty trained, I finally understood that she reacts best to positive and consistent feedback. Unleashing the "no-no, bad girl" negativity was not working! Strange how I KNOW what to do but when the time comes to act I rely first on my emotions. The second talk focused on teaching our children on how to combat spiritual scorpions by teaching them to pray, study the scriptures, and having consistent family time. Our Stake President spoke on finding significance in your life. His message focused on a recent friendship he is making with a retired Army Colonel, who is struggling to find purpose after a life of military service. He included the sweet story of the Bett family from our ward. 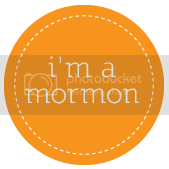 Brother Betts was baptized a year ago. They went through the temple April 24th to have their family sealed for eternity. Their new baby son was born three days later under the covenant. I was leaking tears like no tomorrow while nursing Phillip and listening to the talk in the Mother's Lounge. That is the purpose of life: our family and our family relationships. Everything we do should bring our family closer to God and eternal salvation. We drove back home because Sunday's session was going to be broadcast. Halfway home we received about 6 phone calls alerting us the broadcast was cancelled. We continued home. I am glad we at least made the Saturday session. The diaper fairy princess stopped at our home Sunday night and TOOK all Amelia's diapers with her to the baby princess castle. We had to put on cute underwear Amelia received on her birthday. This week was an emotionally charged one with good times and not so great times. Monday and Tuesday our house was filled with crying, screaming, and naughty behavior on Amelia's side. She did NOT want to use the potty. Monday she peed in her pannies 6 times and pooped twice. Tuesday 8 times for pee and twice for poop. Wednesday she had one accident caused by clothing that was hard to remove. Thursday and Friday just poop accidents. Saturday NO accidents! Once she caught on to actually earning potty treats and realized I was NOT backing down she decided having wet pants was no fun. I think when we get her first poop in the potty she will decide it is fine. She gets cold showers for poop in her pannies. Oddly, this is not really effective. She just stands there, cries a little, then goes on to poop again in her pannies. I think she loves the cheering and strange joyful jumping mommy and daddy do when she is successful. Her treats of choice are chocolate cookies (aka York Peppermint Patties) and 3 Musketeers. During our transitional phase Monday-Wednesday we had a pretty rough go. She spent most of her days sitting on the potty with me reading her books, coloring, watching a movie, and mom crocheting three hats. Thursday morning she got out of bed and went to the potty all by herself before coming to say Good Morning. Yes!! She loves her Princess potty and is showing classic signs of independence...and LOVING the rewards. Way to go Amelia! 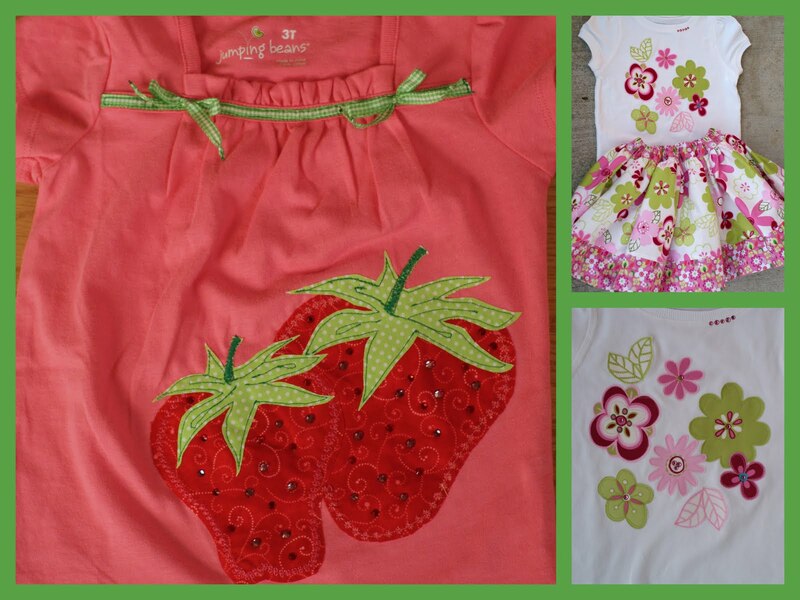 I decided that skirts are awesome for potty training. Can boys wear skirts too? I have a fun reward (Tinkerbell movie) for her once she puts her poop in the potty. Friday she after pooping in her pannies she took them off and threw them in the potty, then came and told me she put her poop in the potty. Indeed, she put her poop in the potty. I had to rephrase that one. Yesterday we drove to Cheyenne for Stake Conference. I took her pink potty with us. We had no accidents in the car or while on the road. She is scared to use the big potties in public places. During the adult session I stopped by nursery to see if she needed to go. Turns out she told one of the ladies there, went to the big girl potty, and wanted 3 potty treats for her effort. I almost dropped my teeth! I love hearing her describe what she thinks is happening to her body. Yesterday she told me the butterflies under her belly button told her she had to go pee-pee. So GLORY ON AMELIA! Hopefully, she will resolve the poop this week.